I'm joining in with the theme of Feathers over at A Snap, A Set and A Song. My interpretation is Blackbird, totally inspired by the song of the same name. 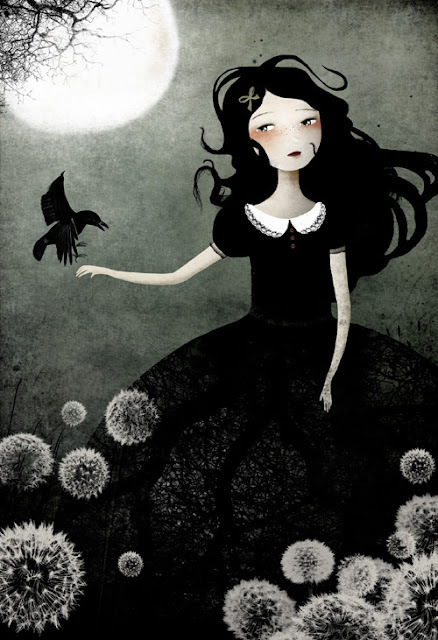 I found this amazing art by Anne-Julie Aubry when I googled 'blackbird' images. This picture was so gorgeous, I instantly added The Nebulous Kingdom to my favourite etsy shop list! I adore, adore, adore this song, which I first really got to know when listening to the brilliant Beatlesque soundtrack of I am Sam. I so love Sarah McLachlan's voice! There is also a wonderful Glee version of this song, which doesn't have a video, but I'd love you to hear the harmonies of the Warblers - stunning! In this episode, Kurt's bird Pavarotti dies, and he asks his friends if they will sing Blackbird with him. I listened to both versions of the song about twenty times while preparing this post. Go visit Thea's blog to join in on this fun game! All that black is so striking. Your set is so beautiful, I love everything. I'd never thought about that song being Beatlesque, but it really is.